I've spent the two month making a radio programme about the art and science of the baroque for BBC Radio 3 that is due to be aired this Sunday on the Sunday Feature. The Baroque was always a style I'd associated with vulgarity and excess. But in this programme I’ve discovered how much control and structure underpins the spectacle of the baroque. 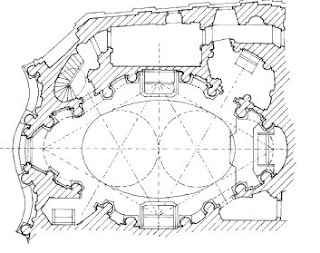 The dramatic and sensational effects of the greatest baroque architects like Borromini and Bernini are founded on sound mathematical principles. Painters like Caravaggio and Rubens are battling with the same problems as Newton and Leibniz in their attempt to capture bodies in motion. And the extravagant sounds of Monteverdi and Bach would not be possible without the mathematical development of new ideas of temperament. It is my world of mathematics and science which allows the artist and musician to play with your emotions. Join me on my journey to the conversion of the delights of the baroque.